King Holiday is an R&B/Hip hop single released in January 1986 by the King Dream Chorus and Holiday Crew. Composed by Phillip Jones, Kurtis Blow, Grandmaster Melle Mel and Bill Adler, it was released in honor of Martin Luther King, Jr. Day, which was first celebrated as a national holiday in the United States on January 20, 1986. All proceeds from the single were donated to the Martin Luther King Jr. Center for Nonviolent Social Change. The single peaked at #30 on the Billboard Hot Black Singles chart. The project was spearheaded by Martin Luther King, Jr.'s youngest son Dexter Scott King, who is credited as the song's executive producer. Once a year we celebrate - Washington and Lincoln on their birthdates. And now a third name is added to the list, A man of peace, "Drum Major for justice". For Freedom, Justice and Equality, To make the world a better place for you and me. It's a holiday! It's a gathering! For the Reverend Dr. Martin Luther King! Dr. King tried to love somebody. Do you wanna love somebody? For his sake put your hate away, Take a day... Take a day to love somebody. Don't play on the Holiday, work to find a better way. Everybody love somebody now. Everybody sing for Martin Luther King. 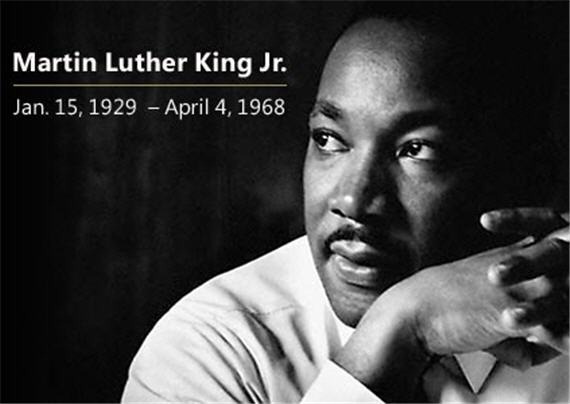 Let freedom ring for Martin Luther King! It's a day for everyone. He had a dream now it's up to you. He had a dream now it's up to you. To see it through, To make it come true! Who do we thank for teaching us That we all have the strensth to love? we thank the Prince of Non-Violence for showing um the way. How do we show the children of today How do live together at one? We'll sing of a King And his words will light all of our tomorrows. How long? Not long? New day will shine, if we just take the chance. His love will glow. Open up the windows! Let the hero shine Every day in your life, Yours and mine. Everybody shine. For the future generation, Dr. King's medication, For successful operation, is PEACE FOR EVERY NATION! I wasn't able to play King Holiday but I did enjoy listening to Rev. King's rousing Mountain top speech. Thank you, friend. For some reason, whenever I try to embed the video, it won't work. I've changed it to a link, and if you click it, it will take you to YouTube and the video.